There was a time in the United States when hotels served as ad hoc homes, providing full time housing as well as hotel services. At that moment, hotel life blurred the difference between tourist architecture and housing architecture. Nowadays those dwelling typologies can become a reference to ensure social benefit on new touristic areas or existing ones. Puigjaner Barberà, Anna. 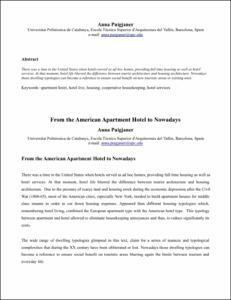 From the american apartment hotel to nowadays. A: Conference of the International Forum on Urbanism. "6th Conference of the International Forum on Urbanism (IFoU): TOURBANISM, Barcelona, 25-27 gener". Barcelona: IFoU, 2012, p. 1-6.